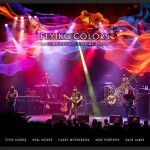 Share the post "Album review: FLYING COLORS – Second Flight: Live at the Z7"
This new live package comes in a plethora of formats – takes a deep breath – 4K UltraHD, Blu-ray, DVD, LP + MP3, double CD/DVD, iTunes, Headphone Surround and Pono. Right now onto the music, this was recorded in Switzerland’s Z7 back in 2014 and was the band’s eighth gig on the October 2014 tour, recorded just a week after the band’s second album, ‘Second Nature’, had been released. The DVD is a joy to watch as you get to see the band close up and marvel at each one’s virtuosity be it Mike Portnoy’s drumming or the rumbling bass runs of Dave LaRue, which really stand out on the intro to ‘Mask Machine’. The band really seem to enjoy each other’s company on stage and Casey McPherson seems a lot more comfortable than on the last tour, where he was the unknown musician to many fans. That soon vanished once we heard his amazing vocals, which combine so well with Neal Morse’s and Mike Portnoy’s vocals. Personal highlights are ‘Kayla’, (I never tire of hearing this song’s vocal harmonies), the straight ahead driving rock of ‘Shoulda Coulda Woulda’, fuelled by Steve Morse’s impeccable guitar playing and ‘Peaceful Harbour’. Only bonus feature are the four music videos the band have released to date. Shame there are no band interviews or backstage footage for the ardent fans. The two CD set has the same tracklisting and running order as the DVD, with the LP and digital versions adding a bonus song in the shape of an orchestral version of ‘Peaceful Harbour’. This entry was posted in ALBUM REVIEWS, ALBUM REVIEWS (Mobile), All Posts, DVD REVIEWS and tagged album, CD, DVD, Flying Colors, live, Mike Portnoy, Neal Morse, prog, review, rock, Second Flight Live at the Z7, Steve Morse. Bookmark the permalink.